Pre.Fuel is a scientifically engineered combination of branched chain amino acids (BCAAs), an amino blend, essential vitamins, minerals and caffeine. This unique blend has been specially formulated by our leading sports specialists and manufactured from high quality ingredients to create an expert pre-workout supplement. For maximum results take Pre.Fuel 20-30 mins prior to training and exercise. Simply add 2 level scoops (approx.10g) to 300-350ml of water in a shaker or blender. Branched Chain Amino Acids (Leucine, Isoleucine, Valine, Emulsifier (Soya Lecithin), Amino Blend (Citrulline Malate, L Arginine, Beta Alanine, L Tyrosine, L Carnitine L Tartrate, Taurine), Citric Acid, Natural Flavouring, Natural Colouring (beet red and carotene), Mineral Premix (Calcium, Magnesium), Caffeine, Sweetener (Sucralose), Sea Salt, Silicon Dioxide, Vitamin Premix (Niacin, Vitamin E (alpha tocopherol), Vitamin B5 (Pantothenic Acid), Vitamin B6 (Pyridoxine HCL), Vitamin B1 (Thiamine), Biotin, Vitamin B12 (Methylcobalamin)), Stabiliser (Xanthan Gum). Contains Soya (Lecithin). With Sweetener. Gluten Free. High Caffeine Content (28mg/100ml). Beta Alanine may cause skin tingling . Pregnant women should consult a GP before use. If you are suffering from a medical condition, please consult your GP. This product is not intended to treat illness. Please do not exceed the recommended dose. Keep out of reach of children. Supplements should not be used as a substitute for a balanced diet. 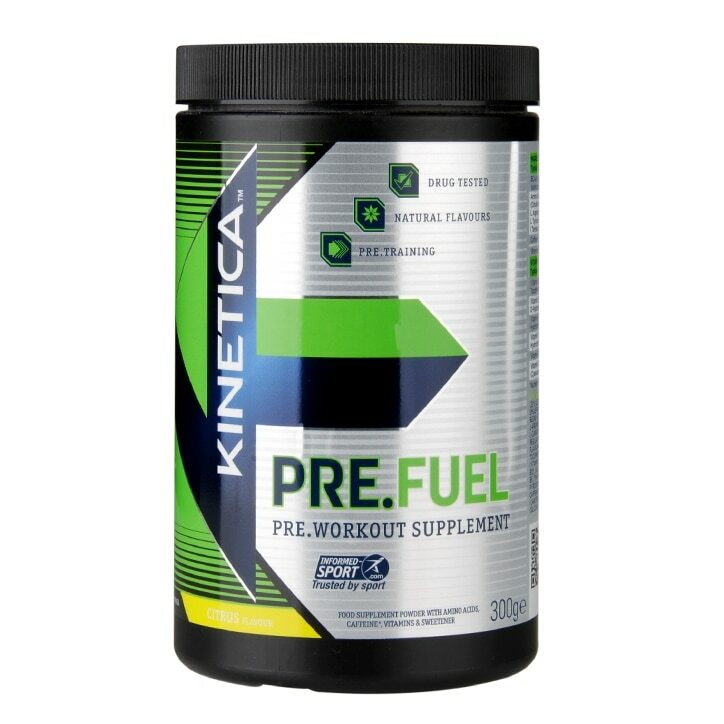 Kinetica Pre.Fuel Powder Berry is rated 5.0 out of 5 by 1.